In 1946, two years before the nationalisation of the railways, Mr. H.G. 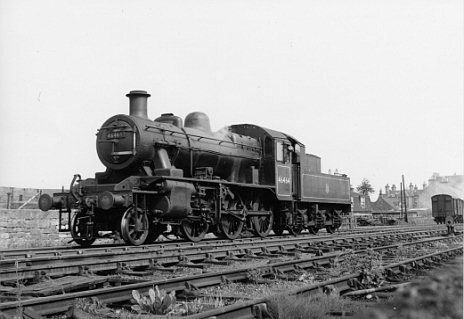 Ivatt, then Chief Mechanical and Electrical Engineer of the London Midland and Scottish Railway, introduced a new modern lightweight tender locomotive. They were classified as 2MT, which meant L.M.S. Power class 2, Mixed Traffic engine. The design of this engine was developed slowly over a long period because of the war and was originally to have been an 0-6-0. It was found that outside cylinders reduced the maximum forces on the axleboxes and allowed space to fit larger axleboxes. The leading pony truck was added to improve the ride at higher speeds. The maximum axle loading of around 13.5 tons ensured a wide route availability for the new engines. The Class 2 shared the new No. 7 boiler with the 2-6-2T tank engine. This had a copper inner firebox and the side stays were made of monel to reduce the likelihood of them suffering fatigue cracking. The Class 2 was designed with post-war labour shortages in mind and incorporated such refinements as a tender cab, manganese steel liners on horns and axlebox faces, rocking grate, self cleaning smokebox and self emptying ashpan. Together with the outside cylinders and valve gear, these made maintenance and operation of the engine easier than had previously been the case, and they became very popular with engine crews and mechanical staff. Initial trials of the engine highlighted problems with poor steaming. These were rectified by fitting a modified chimney with a tapered internal bore to improve the draughting. Intended for use mainly on cross-country and branch line routes they soon proved to be reliable and economic in operation. The engine soon demonstrated that it could deliver quite snappy acceleration and was capable of running at up to 70mph. The L.M.S. went on to build 20 engines to the new design, numbered 6400-6419 between 1946 and 1947. After nationalisation a further 108 engines, numbered 46420-46527 were built by British Rail before the design was incorporated, with very little modification, in to B.R. 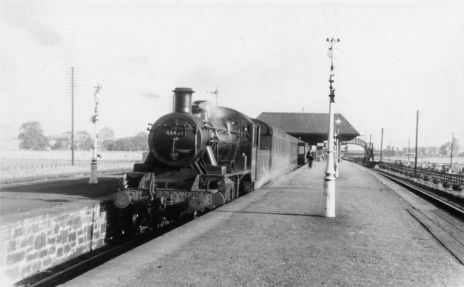 's own standard class 2 in 1953. 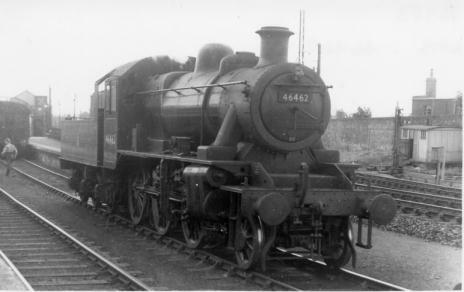 46464 was outshopped in July 1950 from British Rail's Crewe Locomotive Works. The last of a batch of five to be built at Crewe before production moved to Darlington, she was allocated to British Railways Scottish Region along with her sister engine 46463. Both engines were based at Dundee Tay Bridge shed but were allocated, turn and turn about, to Arbroath. 46464 spent her days at Arbroath shed working local services to Dundee and on great many occasions could be found working the Carmyllie Goods service between Eliot Junction and Redford. It was through this that she became known to the locals as the 'Carmyllie Pilot'. While based at Dundee she often worked services over the Tay bridge in to Fife. 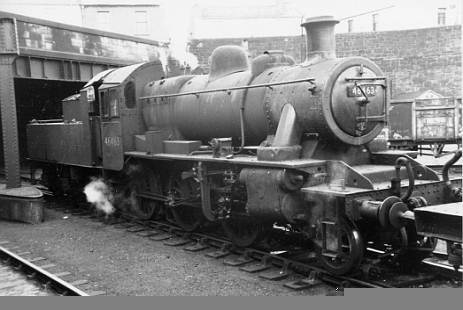 46464 was briefly allocated to Kittybrewster in 1955, she worked on the Buchan line to Peterhead, Fraserburgh and St Combs, deputising for the regular engine, 46460, known to locals as 'The Baby Elephant'. Following B.R. 's decision to replace steam with diesel 46464 was finally withdrawn in December 1966 after only 16 years in service. She had been somewhat neglected in the last years prior to withdrawal, some of the repairs we are having to carry out to the tender illustrate this. 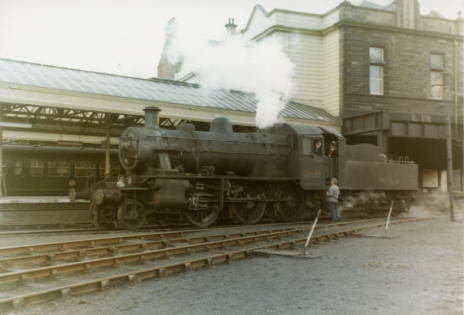 The engine suffered damage some time in 1964, she was apparently hit by a B1 in Dundee, and was sent to Inverurie Loco Works for repairs to the LHS crosshead and footplating. It is perhaps surprising that she was repaired, and not withdrawn at this point. The replacement crosshead came from already withdrawn classmate 46461. 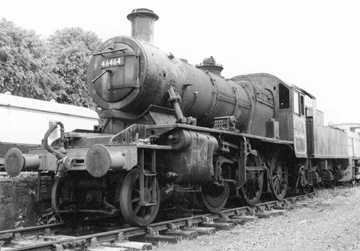 46464 hauled the very last passenger train from Brechin to Forfar on 2nd August 1952 when she had to stand in at the last minute to replace another failed engine. 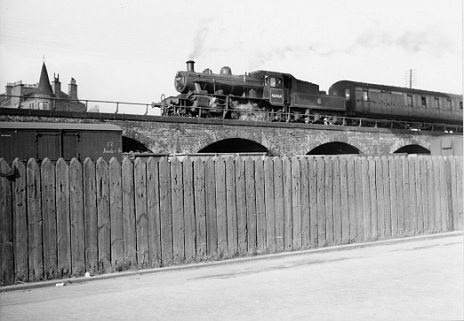 This was her only visit to Brechin, and indeed the only recorded visit of an engine of her class. 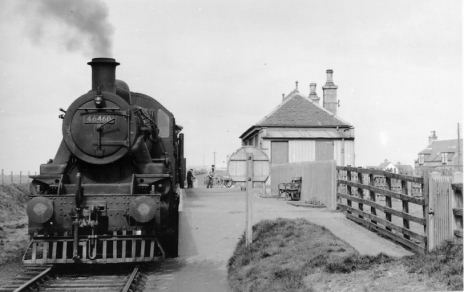 She also hauled the last train to run over the Carmyllie branch, on 19th May 1965. Click here for contemporary report by Ian Fraser. Unlike her sister engine she was saved from the cutters torch by local railway enthusiast the late Mr. Ian N Fraser of Arbroath. Ian is well known in traction engine circles as one of the first people to own a traction engine as a hobby. He purchased the 1915 built Marshall steam tractor 68823 'Jingling Geordie' in 1947 and used it much as most people use their cars, often driving into town to do his shopping at the weekends. His book 'The Arbroath Affair', published in 1961, tells the story of how he overcame the opposition of the local council to build an engine shed and garden railway in the grounds of his house in Arbroath. Although long out of print, some copies of this book are still available from specialist bookshops, and it is well worth getting hold of. 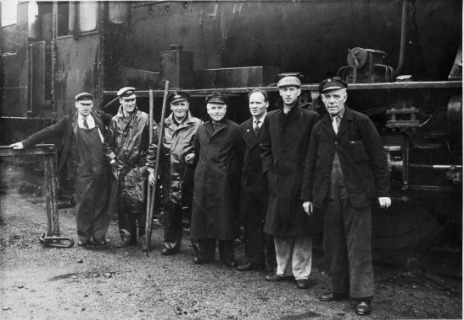 Ian worked as a locomotive engineer with the LNER at Darlington, Doncaster and Inverurie and, following his retirement, made friends with many of the local engine crews. As a result of his interest, he eventually purchased several engines, most notably 46464 and the Gresley D49 'Morayshire', which has recently been overhauled and returned to steam by the SRPS at Bo'ness. 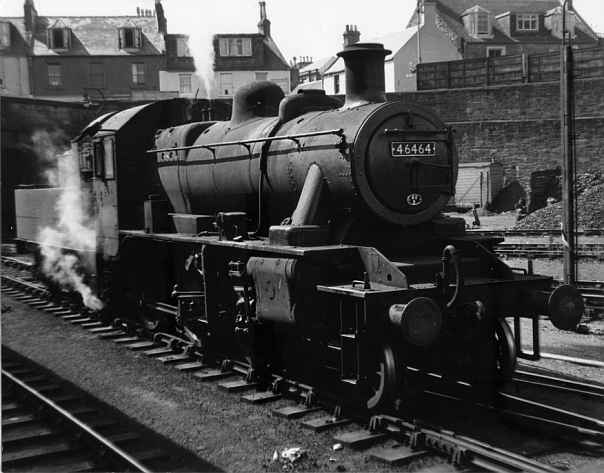 46464 at Leuchars Junction (St. Andrews bay platform). Following her purchase, 46464 was presented to Dundee City Corporation. The initial intention had been to put the engine on display, but she was stored for several years before being loaned to the Strathspey Railway. She hauled the first scheduled passenger train on 22nd of July 1978 and remained in service there for several more years until she suffered accidental firebox damage. The engine has been out of use since then. In fairness, it must be said that she was overdue a major overhaul in any case. Click here for Peter Todd's photo's of 46464 at Aviemore in 1979. 46462 was based at St. Margarets. Date and location unknown. 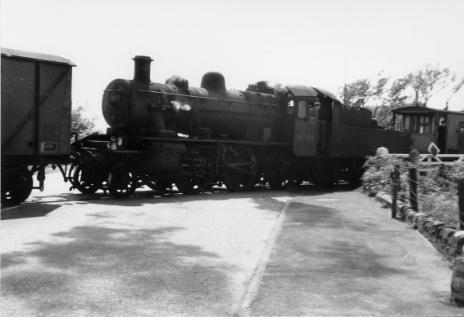 The locomotive was subsequently restored to Mr Fraser's ownership and left the Strathspey Railway on 30th November 1989 to return once more to Brechin. 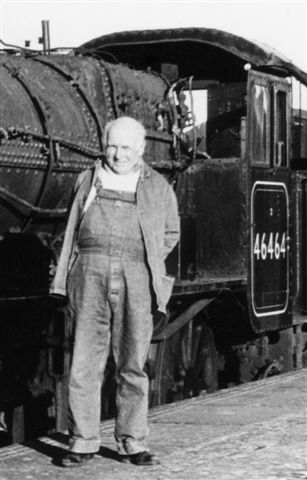 Sadly Mr. Fraser died in 1992 and once legal matters were concluded, plans for the locomotive's restoration were started and some preliminary investigation work took place to determine the overall condition of the engine and to give the railway some idea of the eventual cost of repair. The Caledonian Railway decided in 2000 that it neither had the money or resources to continue with the restoration so a group of us got together and, in July 2000, signed an agreement with the engines' former owner, David Fraser. 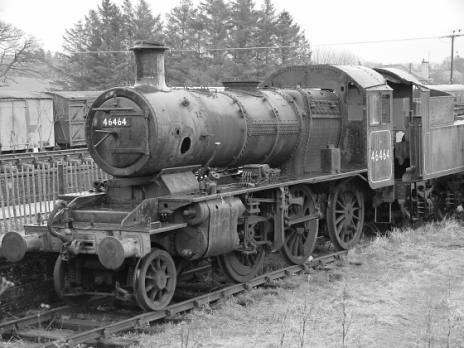 The Carmyllie Pilot Company Ltd was set up to restore and subsequently operate 46464. 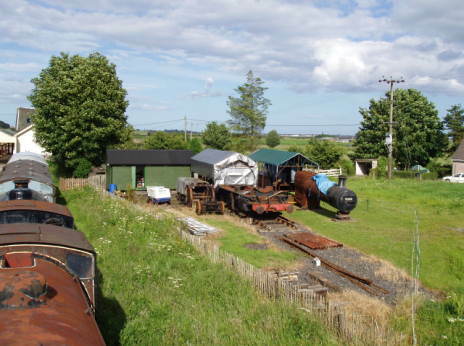 In March 2002 the engine was dismantled and moved from the Caledonian Railway to a private site nearby with better facilities and improved access. The locomotive requires a thorough overhaul, including extensive work to the boiler. This will take several years to complete. Unlike many locomotives saved from scrap yards, however, she is about 95% complete and the missing parts can be relatively easily remanufactured. 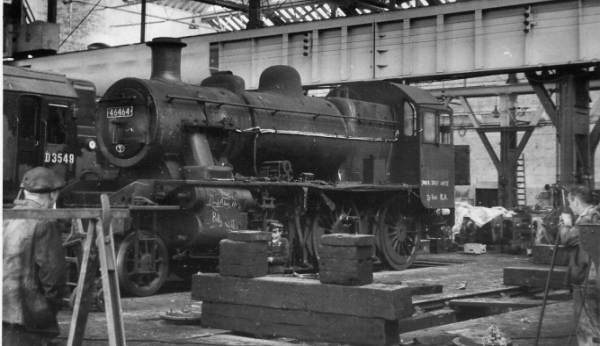 Of the 128 Ivatt class 2's built seven now survive in preservation. They are ideally suited to our heritage railways due to the low maintenance requirement, high reliability and the low axle loading resulting in less wear and tear on the track. The nearest place to us that you can see another Ivatt class 2 (not currently in working order) is the Strathspey Railway, where 46512 is based. Ian Fraser at Bridge of Dun in February 1990.